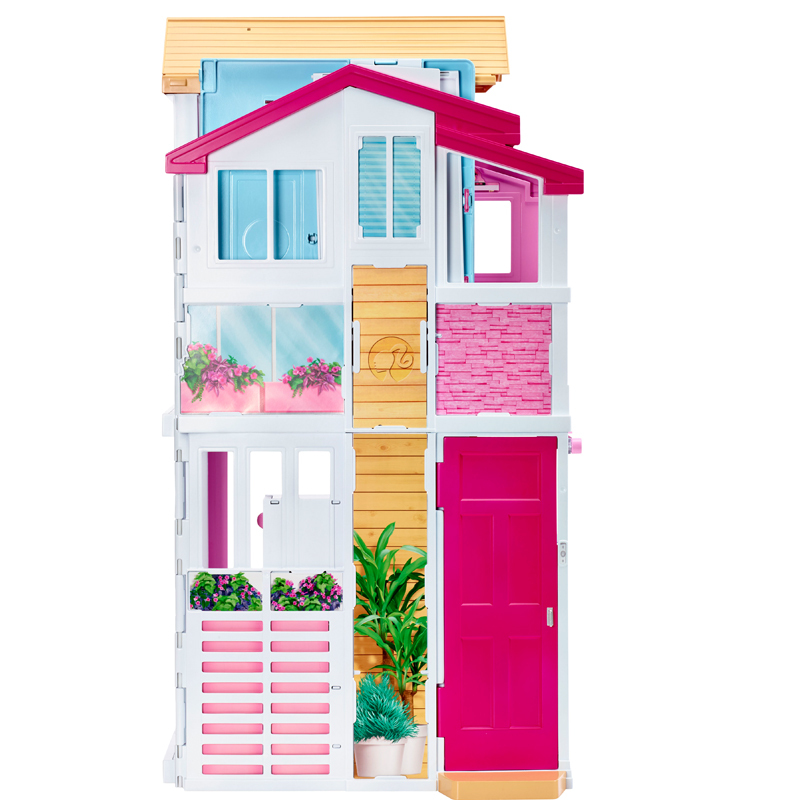 With three stories of play space, the Barbie® 3-Story Townhouse is home to so many storytelling opportunities! 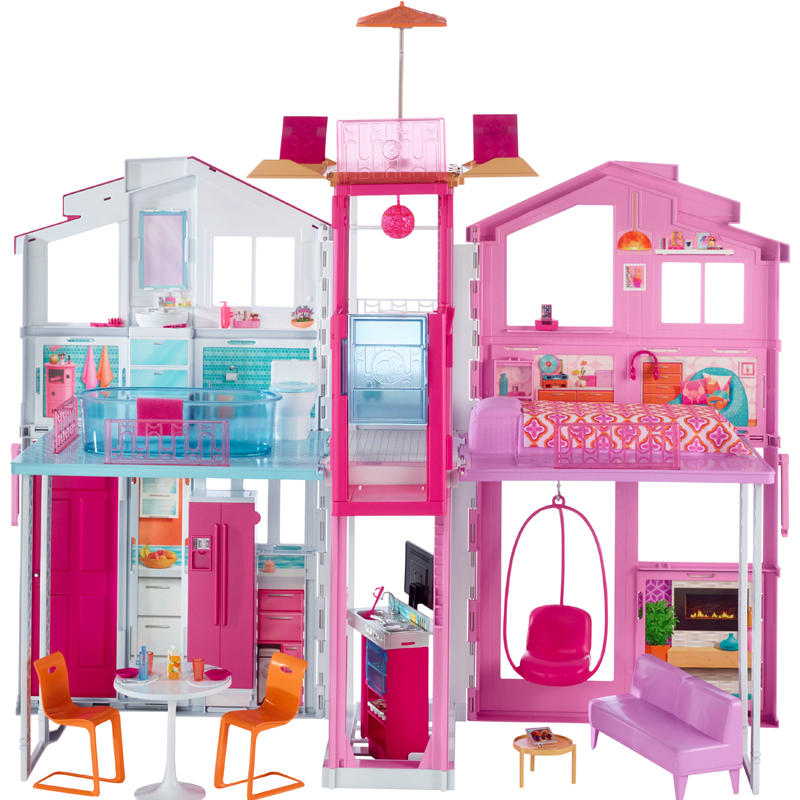 Four rooms and a rooftop lounge, complete with realistic details, make Barbie® doll’s newest house ultra-deluxe. Fabulous furniture and modern accessories inspire creativity and imagination. Fold up the house with accessories inside for easy and convenient storage; unfold with ease to start play! 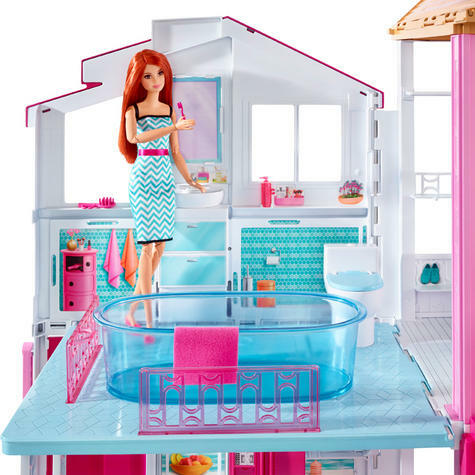 The first floor features a kitchen and living room; the second is home to a bathroom and bedroom, plus a closet to hang Barbie® doll’s fashions! Travel between floors on the sleek child-activated elevator. When Barbie® doll reaches the second floor, the rooftop opens up for a truly fun surprise complete with a colorful pop-up umbrella! On the first floor, a contemporary swinging chair in the living room opens up so Barbie® doll can swing on the inside or the outside of the house. Furniture includes classic pieces with contemporary designs like the transparent and sleek bathtub (which can also be used as a rooftop spa! ), modern dining table and two chairs, footed sofa and cozy-looking bed, all with realistic details. Play out so many fun house stories for Barbie® and all of her friends (dolls sold separately). Additional accessories add to the storytelling possibilities, like a towel for the bath, place settings for the kitchen and doll-sized tablet device for living room entertainment. 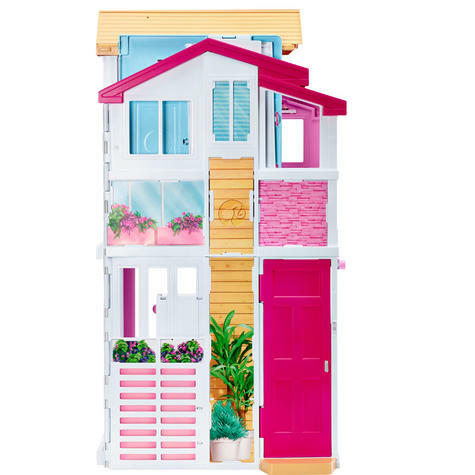 It’s the perfect townhouse for a Barbie® doll’s on-the-go Malibu lifestyle, because with Barbie®, you can be anything! Includes townhouse with working elevator and pop-up umbrella, furniture and accessories. Doll sold separately. Colors and decorations may vary. 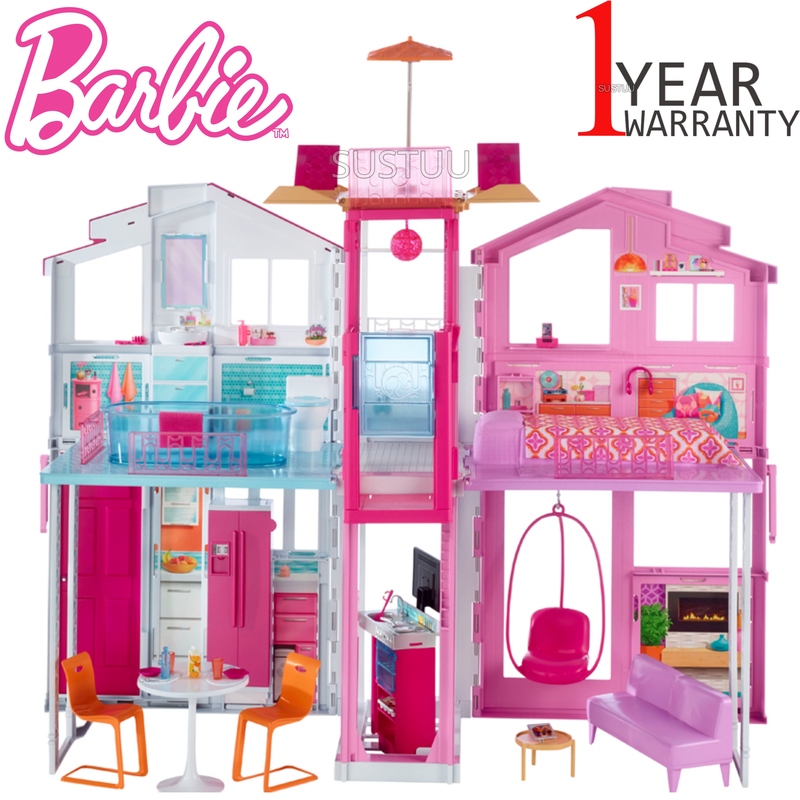 Three deluxe stories of play space make thisBarbie® townhouse home to all kinds of storytelling fun! 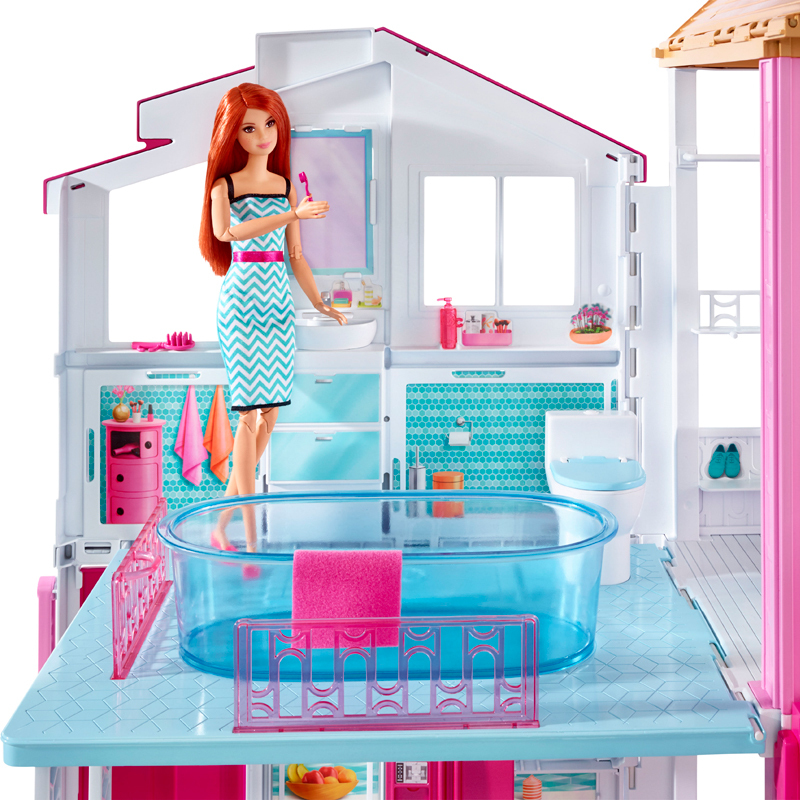 Four rooms and a rooftop lounge, all with realisticdetails, make Barbie® doll’s newest home ultra-deluxe. 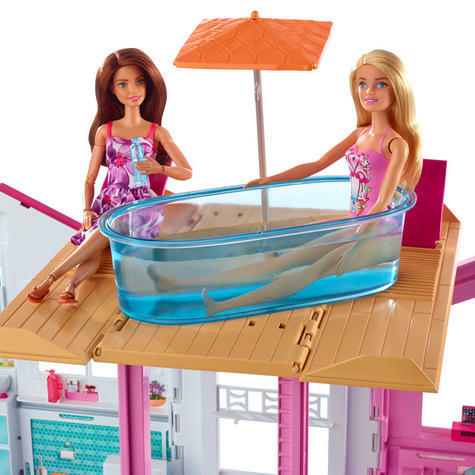 Travel between floors on the sleek child-activated elevator-- when Barbie® doll (sold separately) reaches the secondfloor, the rooftop opens up for a truly fun surprise complete with acolorful pop-up umbrella! The kitchen and living room occupy the first floor; thebathroom and bedroom are on the second; there’s even a closetupstairs for Barbie® doll to hang her fashions! 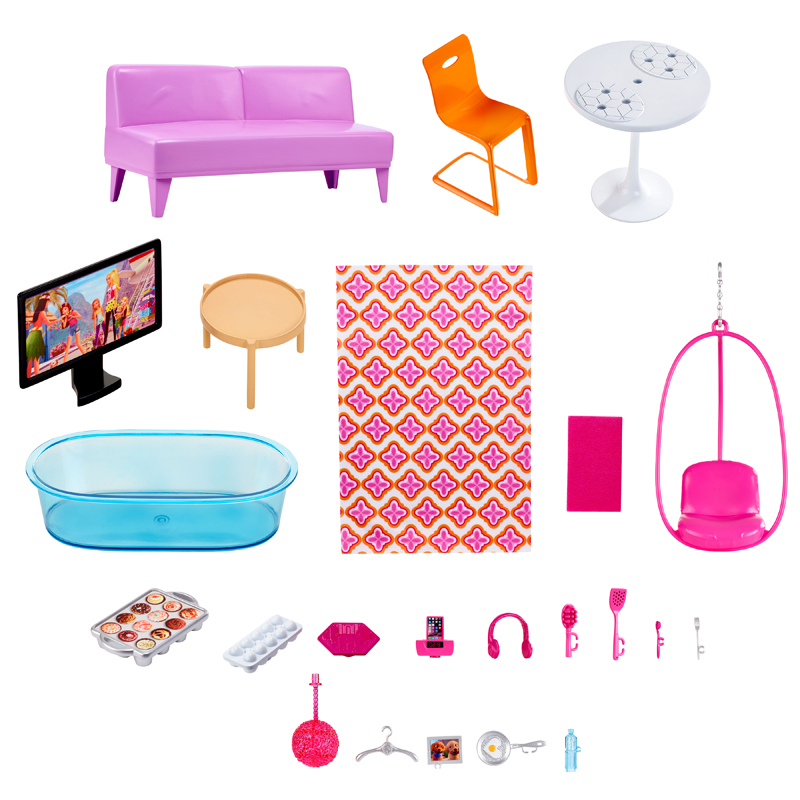 A contemporary swinging chair in the living room opens upso Barbie® doll can swing on the inside or the outside of thehouse. Furniture pieces feature contemporary designs and include atable and two chairs, a sofa, a coffee table, a bed, a bathtub and theswinging chair. Additional accessories -- like a towel, place settings forthe kitchen and doll-sized tablet device -- add to the storytellingpossibilities. Arrange furniture and accessories to suit your style andyour stories!